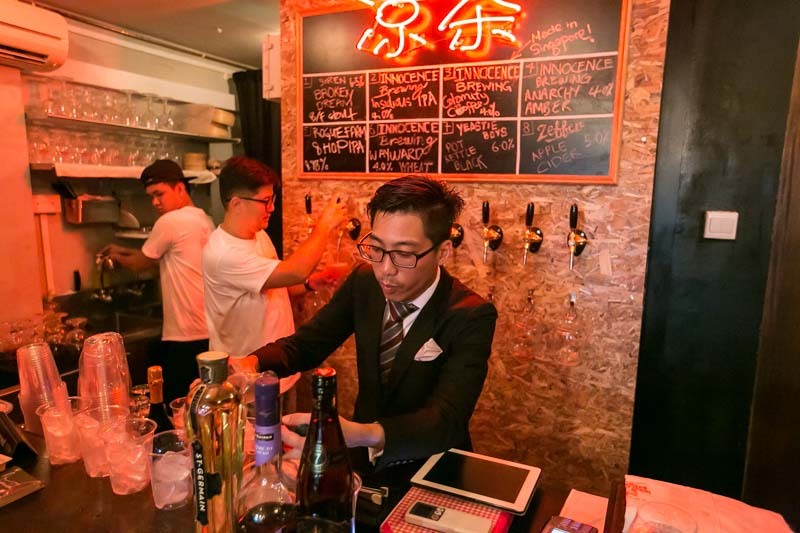 The Craft Beer scene in Singapore has been growing in popularity ever since owners have been importing craft beers from independent breweries in the US. 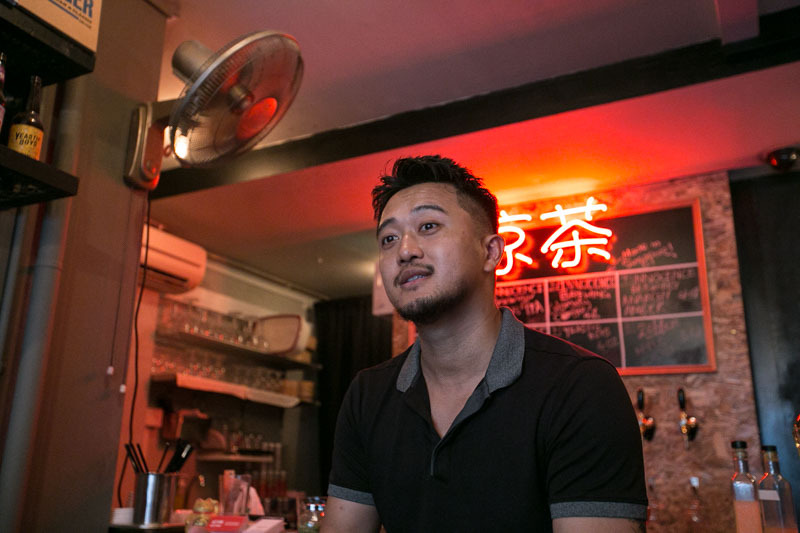 Moving from importing craft beers, local craft beer breweries have been popping up in Singapore trying to create their own brews to cater to the local palate. 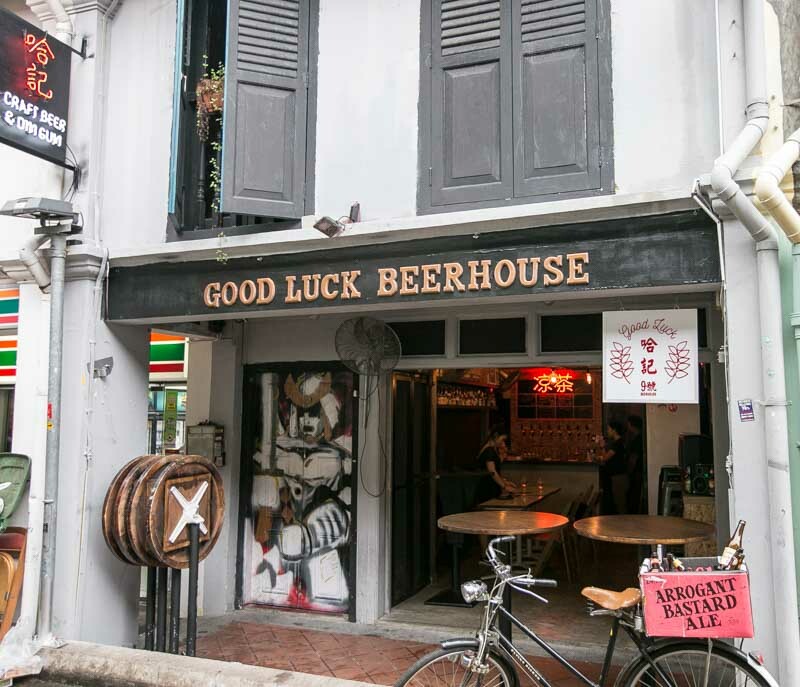 Introducing the latest craft beerhouse to arrive at Haji Lane, Good Luck Beerhouse is located right below cocktail bar, Shin Gi Tai. No surprise since both places are co-owned by owners Kevin and Anthony. I for one am glad that craft beers are making its way into Singapore. Just so bored with commercially brewed beers already. Best part of all the flavour combinations are endless! Bak Kwa infused beer anyone? Oh by the way, did I also mention that you can have dim sum along with your craft beer here. 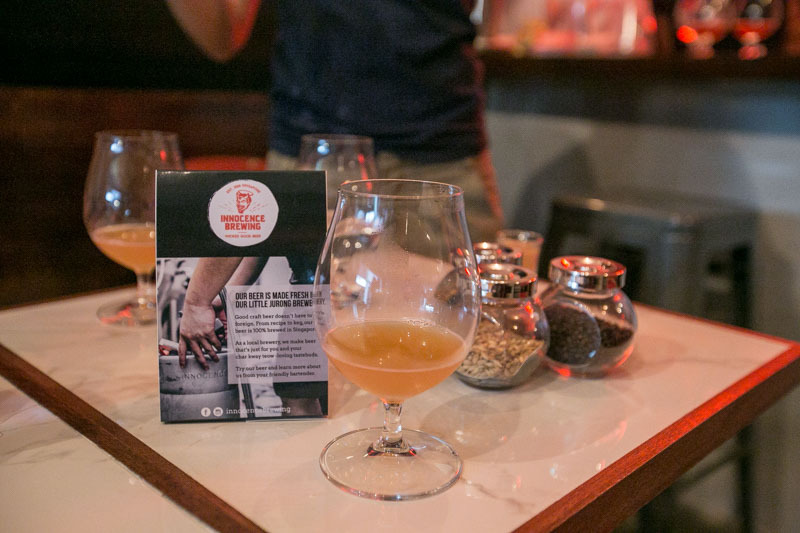 With eight brews on tap ($13 – $18) and over 50 labels of craft beer ($15 – $18) from over 20 breweries around the world, you can be guaranteed to find something that will suit your taste buds. The brews and labels rotate often, so be sure to check what’s on tap before heading down. Spotting a rather warm vibe, there are not many seats available so be prepared to stand especially if you’re planning to head down during peak hours. 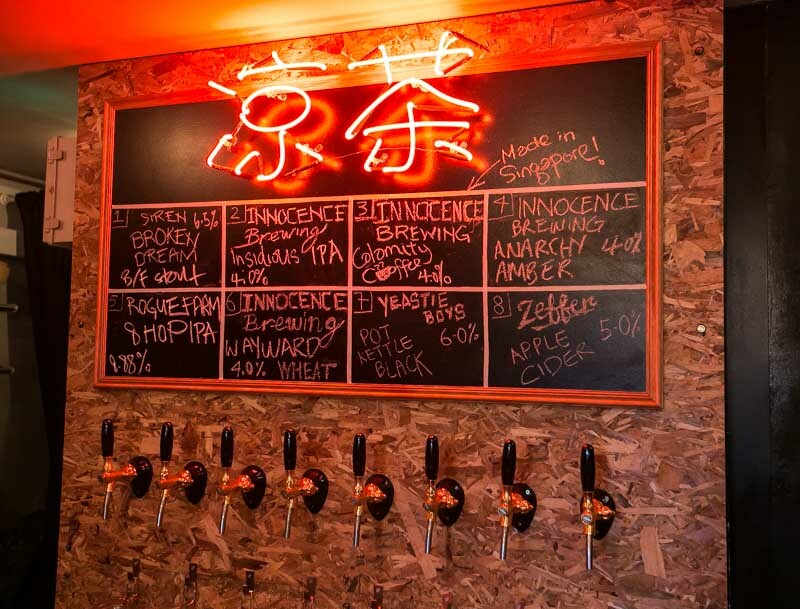 Look out for the brews from local brewery, Innocence Brewing who are introducing four brews that vary in complexity but remain approachable for the everyday drinker. Definitely need to #SupportLocal and have our version of the “Ang Mo Liang Teh“. 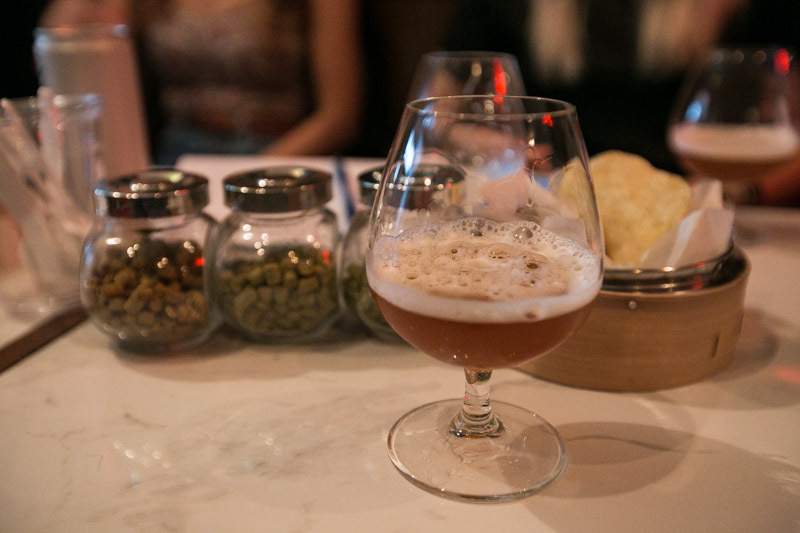 I got the chance to chat with Michael, one of the owners of Innocence Brewing, who introduced us to the craft beer brewing process and took us through a tasting session where we got to try all four brews that are pouring at Good Luck Beerhouse. To those unfamiliar with the process of brewing craft beer, the main ingredient used is barley. 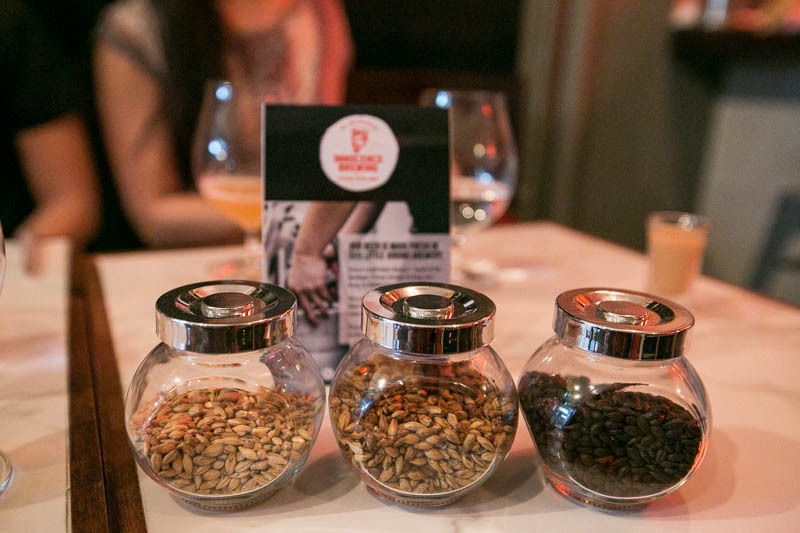 Brewers use different varieties of barley to achieve a certan colour and flavour for each brew. The barley is put through a mill to open the kernels, exposing the starches and allowing it to convert into sugar. Broken kernels or “grist” is added to a mash tun where hot water is added to convert the starches into sugars, resulting in what is called a “wort”. The temperature of the wort is carefully controlled depending on the desired type of beer to be achieved. Next, the kernels are seperated from the liquid through a lauter tun. The wort is collected from the lauter tun and transferred to a brew kettle. Here the boiling process sterilizes the wort and is where hops are added for aroma. 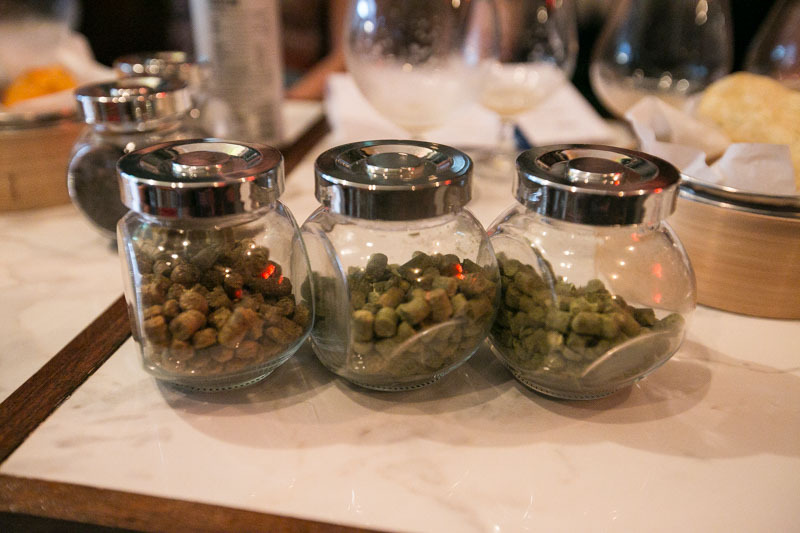 A variety of hops are added depending on the type of flavour and aromas that they want to achieve in the brew. The first of the beers that we got to try for the night is Wayward Wheat. Spotting a cloudy gold colour, the medium bodied wheat beer carried pleasant sweeter flavours such as banana and corn. Don’t expect much hoppiness in this one. It has a slight fizziness to it from the medium carbonation and makes for a mellow finish. Definitely a good choice to get started, try it if you love good fruity notes in your beer. Compared to most IPAs’ (Indian Pale Ale) the Insidious IPA created by Innocence Brewing is meant to be a sessionable IPA with a 4% ABV (Alcohol by volume). A medium body IPA that pours a darker gold, it carries with it a strong citrus aroma thanks to the addition of citra hops. Expect some fizziness with a slightly stronger hops in this one. The fruity notes in this one that promises a clean and sweet finish, which makes it quite the crowd favourite. The Anarchy Amber is a copper hued ale that gives off a earthern toffee aroma. Upon taking the first drink, I was hit by the strong notes of chocolate and nuts that have been heightened by the use of specially selected hops that give off a mild floral bitterness. Each taste leaves an aftertaste of caramel with a crisp and toasty finish. Don’t expect much fizziness from this one. A really palettable drink with a 4% ABV, perfect for anytime of the day. The Calamity Coffee Ale is truely one of its kind. Ground speciality coffee beans are infused during the tail end of the fermentation process to give this brew a characteristic coffee taste. 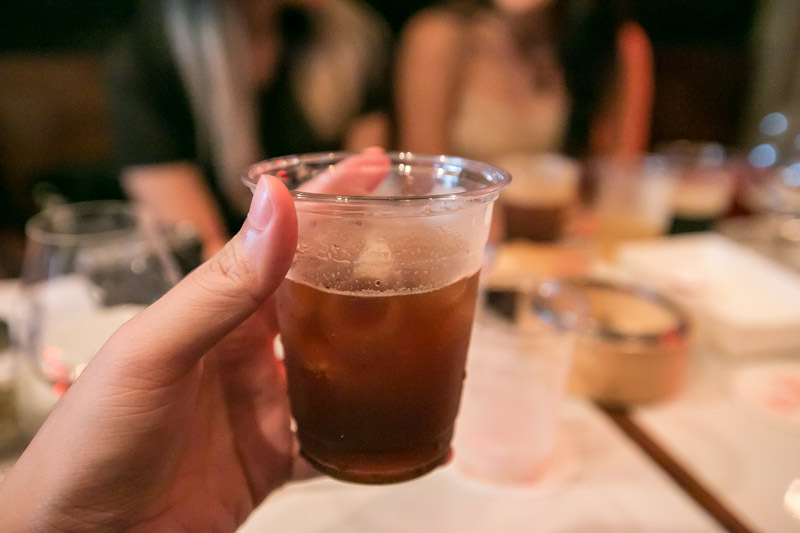 I just love how they tried to match the copper brown colour of this brew which is pretty similar to a cold brew coffee. A rather sweet drink, 4% ABV with hints of toasted caramel with slight hop bitterness and a light and nutty finish in the mouth. After getting to try the four brews, we were given a surprise by Chief Bartender at Shin Gi Tai, Anthony who made us two beer cocktails using the brews from Innocence Brewing. 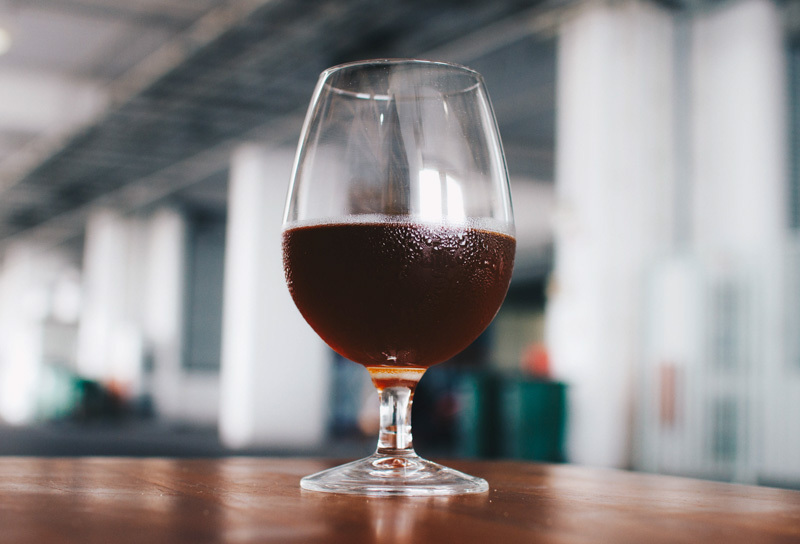 Using the Calamity Coffee Ale, Havana Club Rum and Coffee Liqueur was mixed with it, resulting in a drink that was chocolately and had a smoother and milkier coffee finish. It was an amazing first time experience trying a beer cocktail and am now wondering what other combinations would work with different brews. Time to start experimenting at home. Now that we had so much to drink, we were thankful for having some dim sum bites ($2 – $5) to go along, like this beancurd skin roll with minced pork. An ingenious idea to have hot, crispy and oily bites to help with getting a few more drinks in. 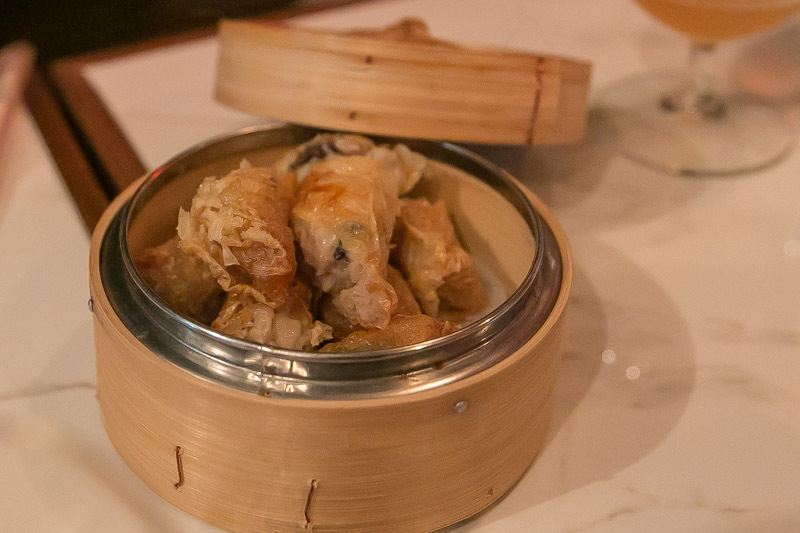 The dim sum menu rotates regularly so you can always expect something different each time you’re there. 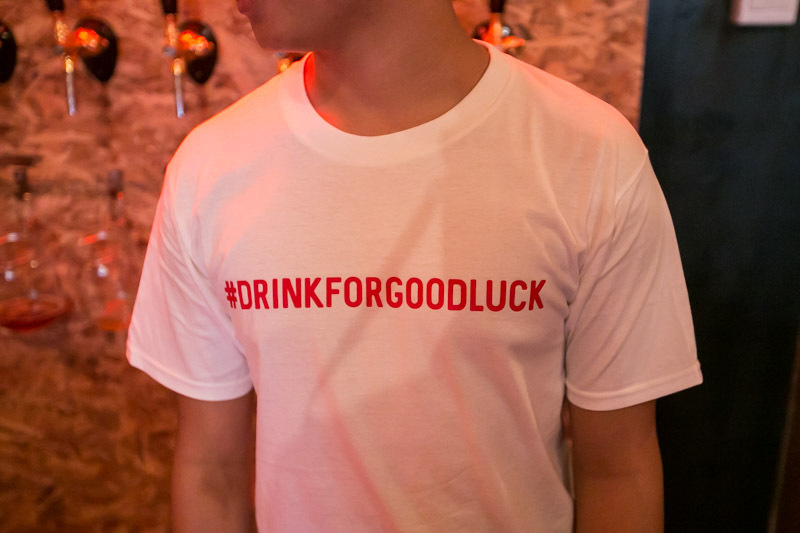 The arrival of Good Luck Beerhouse along Haji Lane might just be what it takes to bring some good vibes to the area. After all, it was one of the places where I used to frequent often. 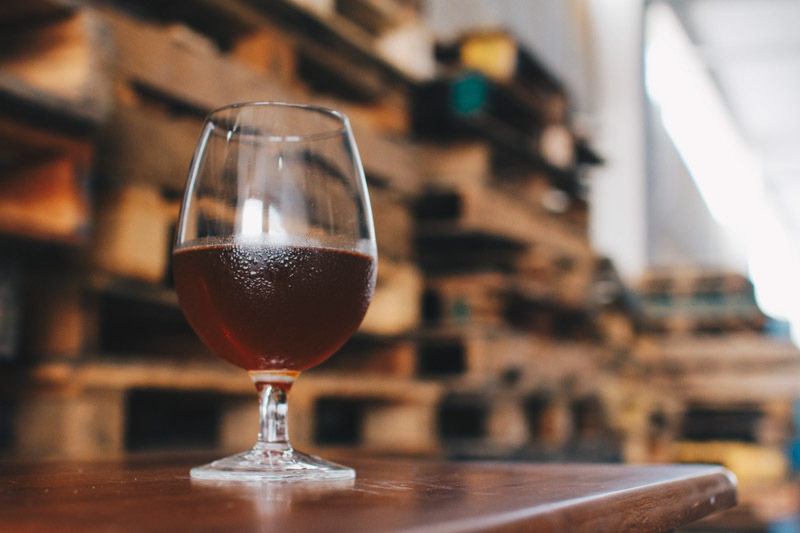 I am excited to see the craft beer community in Singapore growing and look forward to the brews that the local independent breweries can put out to get more people to start drinking, whether it is for good luck or not.